Gong xi fa cai everyone! We're pleased to announce that we have raised $1,800 from the recent Charity Weekend Purrzaar market on 11 and 12 February 2012 (12pm-6pm) at Stacked dim sum bar (Robertson Quay) for the private cattery Blessing Home http://blessinghomeshelter.blogspot.com, where we have volunteered and even adopted a cat, Lola (Snowy)! Cats of the World organisers are selling postcards at $1 and quirky cat photos at $10 that were exhibited in previous years. 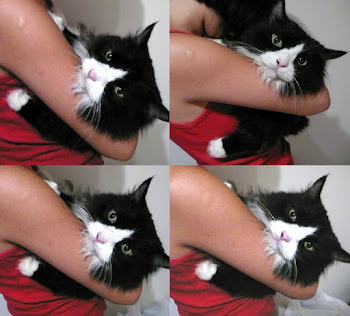 Cat photos are taken all over the world and showcase the cats in interesting settings. Dainty Hands offers all things sweet and pleasing to the eye from cake lollipops to satisfy the sweet tooth to kitty toys and potted grasses to pamper your furry feline friends. 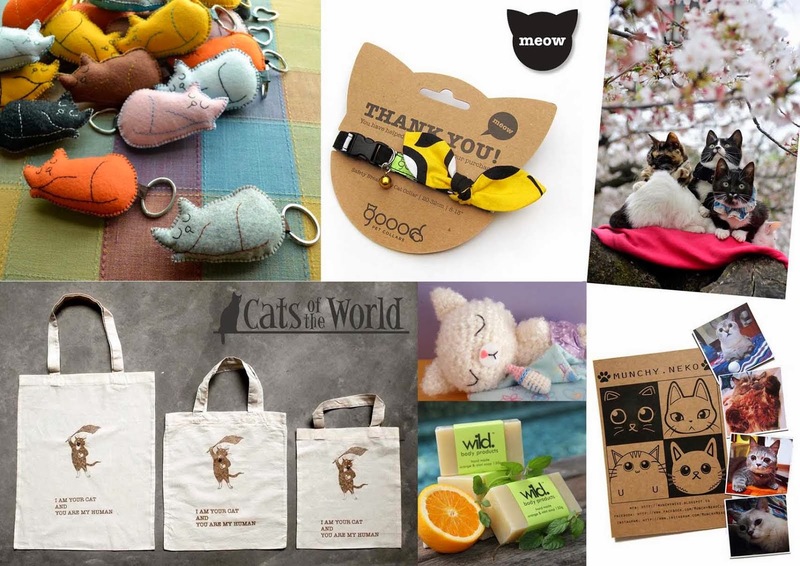 There are cute jewellery such as necklaces and rings, imported tote bags and pouches with sewn-on cat silhouettes. Prices start from $5. Stacked makes a great destination for all-day casual bites, dim sum and drinks by the Singapore River. Enjoy traditional dim sum like Stacked XO Carrot cake and Creamy Custard Pau to Stacked’s signature dumplings and Chilli Crab Pau all day till late, alongside cocktails and bottled beers. During the Purrzaar, Stacked also has a 1-for-1 happy hour deal on all house pours, beers and wine by the glass. 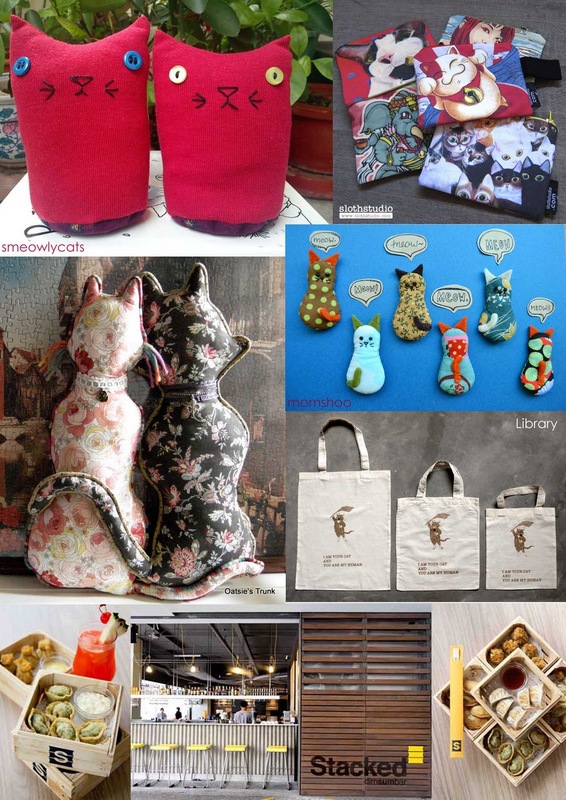 Stacked is donating 50% of the proceeds from its Chilli Crab pau sales on both days of the purrzaar to Blessing Home cattery. Address: 60 Robertson Quay, #01-13, The Quayside. Tel: 6735 7666. This chic-looking cafe overlooking the Singapore River is a cozy joint for all serious coffee and tea lovers. All the coffee is carefully sourced from around the world and roasted weekly onsite using a Giesen 6kg shop roaster. Smitten also offers a selection of top quality single origin or single estate whole leave teas with a mixture of fresh harvest and vintage teas. 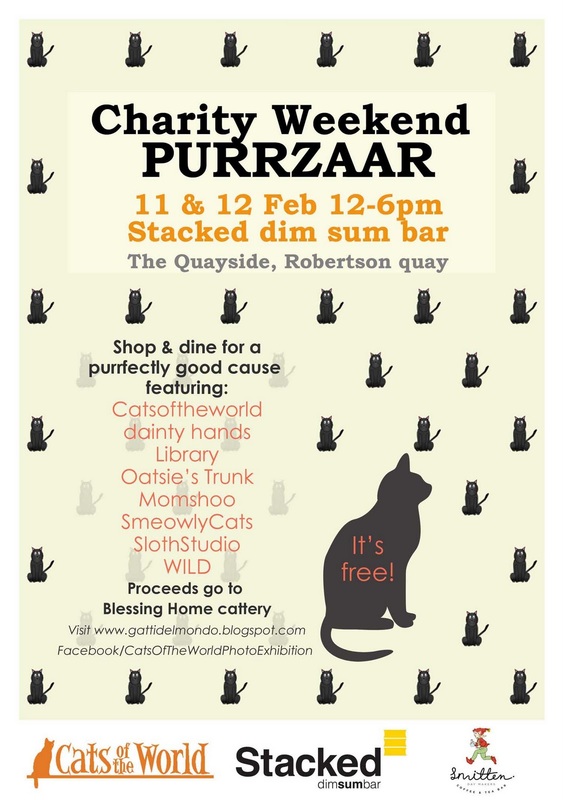 Smitten is donating 15% of their F&B proceeds on both days of the purrzaar to Blessing Home cattery. Address: 60 Robertson Quay, #01-11. Tel: 9876 2347. Thanks for sharing such an amazing and interesting news about Cat day Care. I agree with you completely on the importance of opening oneself up to love and how it makes the whole world a better place.